Mike Richards will greatly benefit having one of his best-friends back with him in LA (Photo by Bridget Samuels). 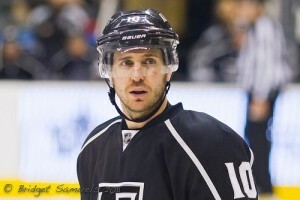 Mike Richards (Los Angeles Kings – C,LW) – Following a series of shocking trades last June, the Philly boys have been reunited in LA. Richards and the Kings have not even seen close to the amount of goals they had anticipated after adding the former Flyers captain in the off-season. With the addition of Jeff Carter, this can only help the tremendous two-way forward, who as of late, has seen regular shifts alongside Dwight King and Jordan Nolan. Richards has been at least a sixty-point-player since entering his prime in the NHL and this season he is significantly below that total being on pace for a measly 47 points. Coincidentally, Carter was right next to him in the locker room for the majority of his sixty-point seasons and one must be certain the Flyers’ 2003 first-rounder is hoping to prove that his thirty-goal days are just the beginning. Derick Brassard (Columbus Blue Jackets – C) – The opportunities for this former Drummondville-superstar are endless with the departure of top-flight forward Jeff Carter and speedy sniper Antoine Vermette. For the time-being, Brassard stands as the sole center capable of attaining high offensive production in Columbus , with Ryan Johansen being not quite ready. Brassard first showed glimpses of NHL success in his rookie season with 25 points in 31 games along with a plus-twelve rating. The Jackets’ former first-round pick has ten points in his last twelve contests and with Rick Nash staying put, he has plenty of potential to continue dishing out assists with a forty-goal scorer nearby. Jared Spurgeon (Minnesota Wild – D) – While it is difficult to say who will be this former long-time Spokane Chiefs defensive partner with the departure of even-strength partner, Greg Zanon and powerplay partner, Marek Zidlicky, one must assume that either Foster or Gilbert will be a nice improvement for the defenseman in terms of offensive production. Moreover, Spurgeon has been given top powerplay time in Minnesota. Before long and on the powerplay, he will have Mikko Koivu set up on the side boards and potentially have a big shot in Foster to send it to every night. The Edmonton-native has points in four consecutive games and even had a streak of ten points over fourteen games earlier this season. Brian Rolston (Boston Bruins – LW) – Rolston was placed on waivers prior to an eventual trade to the Bruins and like in the fantasy world, he is likely to be passed by every manager in the league. The reason one may see an increase in production by this 38-year-old Michigan-native is that he has potential to play in the Bruins top-six with the injuries to Nathan Horton and Rich Peverley. With that, Rolston sees a definite upgrade from playing with Islanders, Matt Martin and Josh Bailey. One can draw similar comparisons to Cory Stillman from last season as he had started the year in Florida with 23 points in his first 44 games but finished in Carolina with sixteen points in 21 games. Marek Zidlicky (New Jersey Devils – D) – The disgruntled Czech sought a trade to the Devils after a series of healthy scratches in Minnesota. Zidlicky will be manning the top powerplay point in New Jersey and will be dishing the puck to a former player, once dealt at the deadline, Ilya Kovalchuk. Zidlicky virtually faces no competition to lead the offense from the back end as it does not seem as if Lou or Deboer are comfortable with the play of Matt Taormina. The 35-year-old has had a point-per-game average of 0.52, 0.55, 0.55 and 0.54 over his past four seasons which would rank in the top-twenty for defenseman in the league. This friend of Petr Sykora and Patrik Elias has points in three of his last five games. Cody Hodgson (Buffalo Sabres – C,RW) – Perhaps in the most shocking deal to occur on February 27th, Toronto-native Hodgson will be much closer to home playing for the just-over-the-border Sabres. Having been buried behind Ryan Kesler and Henrik Sedin in Vancouver, Hodgson never had the opportunity to excel like he will in Buffalo. While Buffalo still has a few stud centers in Derek Roy, Ville Leino and Tyler Ennis, Hodgson will be surely utilized to his fully capacity to show what he can do. The former-tenth-overall-pick excelled year-after-year in Brampton of the OHL and is finally showing his pizzazz at the NHL level with sixteen goals so far this season while only playing 12:43 per night. Wojtek Wolski (Florida Panthers – LW) – Wolski, who has spent almost the entire season either in the press box or in Connecticut, has been traded three times over the past three seasons for far less value each time. His weak work ethic and inability to play hard along the boards has led to him being an afterthought in most hockey pools. However, he has put himself in the good books of Kevin Dineen and Florida fans after scoring a late, game-tying goal in his debut on Sunday. Born of Polish parents, he played his first game on the beach next to Shawn Matthias and Mike Santorelli, along with quality powerplay time. Wolski will take full advantage of this short opportunity while he realizes this may be his last at the NHL level. He is worthy of a flyer in deep fantasy leagues as when he was dealt to Phoenix two deadlines ago, he managed eighteen points in his final eighteen games. Slava Voynov (Los Angeles Kings – D) – On the international stage, in the American Hockey League and in Russia, this 22-year-old Russian has demonstrated he is capable of being a game-changer, especially in the offensive end. Voynov is a former early, second round-pick by the Kings and has not been given much of a fair shake in terms of powerplay time, aside from when Doughty was held out of the lineup. Fortunately for him, Jack Johnson was traded to Columbus and he is now seeing a regular shift on both the powerplay and at even-strength. Voynov is one year removed from honing his craft in the AHL with 51 points in 76 games and is worthy of a look before it is too late. Dwight King (Los Angeles Kings – LW) – It must first be noted that his name is Dwight and NOT D.J. King. This Kings’ fourth-rounder has not exactly put up marquee numbers at any level, but with the addition of Jeff Carter, he will have plenty of opportunity to send off the puck and let Richards and Carter work their offensive magic. King will likely not stick on that line for very long, but he could face the same effect that Nodl saw in early 2010, where he put up nine points in ten games. Furthermore, he might see similar numbers to Knuble, who had ten points over seven games in early 2008, next to Richards and Carter. Rene Bourque (Montreal Canadiens – LW,RW) – Over the past 150 days, Bourque has fallen from a power forward capable of putting up terrific goal-scoring numbers to a third-liner on a mess of a roster. In Montreal, he has managed four goals in nineteen games to go with a minus-eight rating. Fortunately, this three-time twenty-goal scorer will have plenty of opportunity to turn his game around and garner respect from the faithful in Montreal with the departure of Andrei Kostitsyn. Bourque had been playing third-line minutes next to Scott Gomez and Ryan White, but is likely first in line to fill in on the second line next to Tomas Plekanec and Lars Eller. Lac La Biche’s lone NHL player has held a pace of over fifty-points throughout the past three seasons, so time will tell whether or not Bourque can make a return to those impressive numbers. David Jones (Colorado Avalanche – RW) – Thought to be a main deadline day target, Jones has played his way back into the hearts of Colorado fans with twelve points in his last ten clashes. With the departure of Winnik and Galiardi, that’s an extra thirty minutes a night for Avalanche forwards. Steve Downie (Colorado Avalanche – RW) – Playing with rising star Gabriel Landeskog and potential future-captain of the Avs, Ryan O’Reilly, Downie will have every chance to crash the net with these young guns, who often and always shoot the puck. Tom Gilbert (Minnesota Wild – D) – Gilbert will potentially man the top powerplay with either Spurgeon or Foster. In 2009-10, to end the season he excelled with twenty points in his final 21 games. Marc-Andre Gragnani (Vancouver Canucks – D) – Once Salo leaves, Gragnani will have plenty of opportunity to develop for the long-term. This Montreal-native put up seven points in the playoffs last year over seven games for the Sabres.